Law Web: Whether it is permissible for landlord to take Architect with him at the time of inspection of tenanted premises? Whether it is permissible for landlord to take Architect with him at the time of inspection of tenanted premises? For the said purpose, it would be necessary for the plaintiff to ascertain the exact area in occupation of the defendants and for the said purpose he has right to enter upon the premises and inspect the area in occupation of the defendants. In doing so, he would be entitled to take his own representative to measure the area. The landlord would not be an expert to measure the premises. The person who is expert to carry out measurement such as the surveyor would be required to be taken by the landlord to inspect the premises for performing his obligation of providing the same carpet area in occupation of the tenant in the new building. The landlord will have to satisfy himself of the exact area in occupation of the tenant so as to provide for the same. If Section 28 is interpreted in a manner that the landlord cannot take any other representative along with him, then it would render the said provision ineffective and redundant as the purpose of inspection would not be achieved. Even if to satisfy himself the plaintiff measures the tenanted premises through his surveyor, the said measurement carried out by the surveyor will not be akin to and on the same pedestal as that of the Court Commissioner. The tenant being in occupation of the premises, he can get his area measured through his expert. There is no prohibition for him. In the present case, the surveyor allowed to be taken by the plaintiff is not in the capacity of a Court Commissioner but the Court has only granted leave allowing the plaintiff to exercise his right under section 28 as the suit is pending before the Court. 17. In the present case, the plaintiff had given a notice to the defendant to allow him to inspect the premises along with his architect/surveyor (the said fact is denied by the defendants) and as the suit is pending the plaintiff thought it fit to obtain leave of the Court and the same has been granted by the Court. However, the said order of the Court cannot be construed of having appointed a Court Commissioner nor the measurement carried out by the plaintiff through his surveyor would be construed as a measurement carried out by the Court Commissioner. The measurement carried out by the surveyor of the plaintiff would be for satisfaction of the plaintiff to ascertain exact area in occupation of tenant. It will be for the plaintiff to prove his case with all corroborative evidence. Suresh Manoharlal Jumani Vs. Aasia Management & Consultancy Pvt. Ltd.
1. The petitioners/defendants impugn the order passed by the Judge, Small Causes Court, allowing the application of the plaintiff seeking inspection of the suit premises along with its representatives/Architect/surveyors and other professionals for taking measurements, filed under Section 28 of the Maharashtra Rent Act. The plaintiff is the landlord and the defendants/present petitioners are the tenants of the suit premises. The plaintiff has filed a suit bearing R.A.E. Suit No. 150/208 of 2010 seeking vacant and peaceful possession of the suit premises from the defendants by invoking Section 16(1)(i) of the Maharashtra Rent Control Act, 1999, (hereinafter referred to as 'Rent Act of 1999' for the sake of brevity) i.e. seeking recovery of possession of the suit premises reasonably and bonafidely for demolition and reconstruction as envisaged under section 16(1)(i) of the Act of 1999. As per the said Act, the plaintiff has to give an undertaking as prescribed under Section 16(6)(d) of the said Act. One of the undertakings that is required to be given is that Plans and estimates for the new building or new floor or floors to be erected by the landlord include premises for each tenant with carpet area equivalent to the area of the premises in his occupation in the building sought to be demolished subject to a variation of 5 percent in the area. 2. According to the plaintiff, the area in occupation of the present petitioner no. 1/defendant no. 1 is 200 sq. ft. and that of petitioner no. 2/defendant no. 4 is 730 sq. ft., whereas, according to the defendants, the area in occupation of petitioner no. 1/defendant no. 1 is 203.50 sq. ft and that of petitioner no. 2/defendant no. 4 is 1565 sq. ft.
3. Before adducing the examination-in-chief, the plaintiff filed the instant application invoking section 28 of the Rent Act of 1999 seeking inspection of the suit premises along with its representatives for carrying out measurements. The said application is allowed. Aggrieved thereby, the present petition. 4. Mr. A.Y. Sakhre, the learned senior counsel for the petitioners, during the course of his erudite arguments, put forth the following propositions. (i) The concept of inspection and measurements are distinct from each other. 'Inspection' relates to ascertaining the quality, condition or authenticity of an item, product, etc, whereas measurement relates to ascertaining the extent or quantity of something. The learned senior counsel relies on definition of 'inspection and measurement' as laid down in Oxford English Dictionary and Law of Lexicon. (ii) Section 28 of the Rent Act of 1999 permits a landlord to only inspect the premises and does not entitle the landlord to carry out measurements. According to the learned senior counsel, the language of the section is clear and unambiguous and the term 'inspection' can be and ought to be interpreted on the basis of its plain meaning and does not require any external aid for interpretation. The literal interpretation of the said section is unambiguous and does not give rise to any absurdity, and so, no question arises of purposively interpreting the term or the provision. To buttress his submissions, the learned senior counsel relies on the Judgment of the Apex Court in a case of Kanai Lal Sur Vs. Paramnidhi Sadhukhan, reported in MANU/SC/0097/1957 : AIR 1957 SC 907 and in a case of Satheedevi Vs Prasanna reported in MANU/SC/0367/2010 : AIR 2010 SC 2777 and the Judgment of the Apex Court in a case of Gurudevdatta VKSSS Maryadit Vs. State of Maharashtra, reported in MANU/SC/0191/2001 : AIR 2001 SC 1980. According to the learned senior counsel, the cardinal principles of interpretation of statute is that the words of a statute must be understood in their natural ordinary or popular sense and construed according to their grammatical meaning and that is the golden rule of interpretation. In the present case, the grammatical meaning of the word 'inspection' appearing in the provision is 'not capable of any other interpretation and the same is unambiguous. (iii) The Rent Control Act is welfare legislation for the protection of tenant and any provision conferring a right on the landlord has to be construed strictly and narrowly against the landlord in case any such provision is capable of more than one interpretation. The learned senior counsel relies on the Judgment of the Apex Court in a case of Mohd. Shafi Vs. Addl. Dist & Sessions Judge, Allahabad, reported in MANU/SC/0485/1976 : AIR 1977 SC 836. (iv) Chapter VII of the Act of 1999 specifically deals with 'provisions regarding jurisdiction of courts, suits, appeals, practice and procedure'. Section 28 has been placed in Chapter VI and not in Chapter VII, thereby, implying that section 28 was never intended to relate to procedure to be followed in trial of a suit and therefore section 28 of the Act cannot be relied during the pendency of a lis. (v) It is Section 37 of the Act which provides for procedure of the Courts and specifically states that the Courts shall follow the prescribed procedure in trying and hearing the suits. Section 43 of the Presidency Small Causes Court Act, 1881 and Rule 1(2) of the Presidency Small causes Court Rules, prescribe that the Small Cause Court must follow the procedure laid down in the Code of Civil Procedure, 1908. (vi) Section 28 only refers to "landlord" and not to his agent, representative or person acting through him and section 7(3) of the Act of 1999 defines the term 'landlord' as a person who is receiving or entitled to receive rent on his own account or on account of any other person. The definition, therefore, does not include a mere agent or representative of a landlord. (vii) On the other hand, Section 29 contains specific reference to include a landlord and any person acting or purporting to act on his behalf. In view of such a distinction in the language used, legislative intent is clear that only landlord and not agent or representative of landlord was empowered under section 28 to take inspection. (viii) No rules are framed by the State Government under the Rent Act of 1999. The Rules framed under the Bombay Rent Act of 1947 are adopted in their entirety. Rules framed under the Bombay Rent Act of 1947, more particularly rule 2(b), specifically provide for filing a 'miscellaneous application' where no suit had already been filed and pending for fixation of standard rent, determination of permitted increases, restoration of essential services etc. The said rules are adopted. It is clear that no provision is made for filing an application under section 28 of the Rent Act. In a way, no remedy has been provided for noncompliance of section 28 of the Act by the Rent Act, 1999. Refusal of inspection does not render a tenant liable for any offence nor does it constitute a ground for eviction. The provision, therefore, is illusory and this is a defect in the Act. The only remedy, therefore, for a landlord will be to file a suit before the Civil Court for appropriate reliefs. (ix) According to the learned senior counsel, if there is a defect in the statute, even if a party is left remediless, the Court cannot legislate on its own and read something into the statute which the legislature omitted to provide for. The learned senior counsel relies on the Judgment of the Apex Court in a case of Bharat Aluminium Vs. Kaiser Aluminium reported in MANU/SC/0722/2012 : 2012 (9th Vol) SCC 552. (x) Section 28 cannot be had recourse to during the pendency of a lis for the purpose of collecting evidence. Adopting such an interpretation does not render the landlord remediless. It is open to the landlord to apply to the Court for appointment of a Court Commissioner under Order 26 Rule 9 of CPC at appropriate stage of the suit, i.e. after both parties have filed their evidence, and if the Court finds it necessary at that stage. Adopting a contrary interpretation would enable a landlord to circumvent the provisions of Order 26, Rule 9 of the C.P.C. and will enable a party to collect evidence through the process of the Court, which it cannot. (xi) The reliance on Order 39 Rule 7 of CPC cannot be also placed, as contended by the respondent. The same is placed in the Chapter titled 'temporary injunctions'. It can be used only in relation to applications for temporary injunctions. Moreover, the said provision cannot be used to collect evidence. If the plaintiff in cross examination is shattered and the case of the defendant is proved, then there is no need to appoint any expert also. It has to be left to the Judge concerned. It is a premature stage even for appointment of the Court Commissioner. Nothing is pleaded about Order 26 Rule 9 of CPC. (xii) The defendant may prove his case. It may not be necessary to appoint the expert. The present application is filed only for collecting the evidence. (xiii) If the tenant calls upon the landlord pursuant to section 14 of the Act to carry out certain repairs and the landlord in terms calls upon the tenant to permit inspection of the premises to ascertain the extent of repairs to be carried out, but if the tenant refuses to permit inspection, then the tenant will preclude the landlord from carrying out the repairs and cannot then allege that the landlord has failed to carry out repairs and in doing so, the tenant will also preclude himself from carrying out repairs on his own. As such, reliance on section 14 of the Rent Act would be of no avail. (xiv) The Court has exercised the jurisdiction not vested in it. As such, the order deserves to be quashed and set aside. (ii) There is a huge difference between mere visiting of tenanted premises by the landlord and seeking inspection of tenanted premises by the landlord which is allowed under section 28 of the Act of 1999. The provision and the words in the said provision will have to be given purposive interpretation. The construction which will improve the workability of the statute, to be mere effective and purposive, should be preferred to any other interpretation which may lead to undesirable result. The learned senior counsel relies on the Judgment of the Apex Court in a case of the Executive Engineer Vs. Sri Seetaram Rice Mill, reported in MANU/SC/1334/2011 : (2012) II Vol. SCC 108. (iii) The word "inspection of premises' has been specifically laid down rather than mere visiting of premises. The intent of legislature is clear that the landlord can exercise its right to seek inspection of the premises under section 28 of the Act before, during and after a dispute has arisen between the landlord and tenant or before, during and after filing of the suit and pending by and between a landlord and the tenant pertaining to the tenanted premises. Section 28 does not mention any particular timeframe or any particular stage in a proceedings. (iv) In somewhat similar set of facts, the learned Single Judge of this Court in a case of Empeegee Portfolio Services Pvt. Ltd. Vs. Sharada Navinchandra Shah, MANU/MH/1359/2008 : 2009 (1) Bom C.R. 579 has held that to inspect the premises covers a critical examination. It cannot be mere causal glance or mere ocular inspection. There is no such mention nor contemplated in this section. The learned senior counsel also relies on the Judgment in the case of Kamlabai Laxman Mutraj Vs. Bherumal Verimal Haran delivered in Writ Petition No. 8318 of 2008 and states that the learned Single Judge of this Court in the said case has held that there is no reason to restrict the landlord's right to inspect the premises through the Court Commissioner. (v) Even under Order 39 Rule 7A CPC the trial Court has power to order inspection of the premises which includes inspection of properties even inspection of properties which may not be the subject matter of the suit provided such inspection is necessary for the controversy. The learned senior counsel relies on the Judgment of the learned Single Judge of this Court in a case of Madukar R. Javle Vs. Baskar Ramnath Shibad, reported in MANU/MH/0022/1996 : 1996 (1) Mh.L.J. 245. (vi) If the plaintiff is allowed to take inspection of the premises along with its representative for taking measurements of the tenanted premises, the same shall not amount to providing assistance by the Court in collection of evidence, as alleged by the petitioners. The onus would be on the plaintiff to prove the said measurements. It cannot amount to collecting the evidence nor it would amount to appointing the Court Commissioner. (vii) The provisions under section 75, Order 26(9), Order 39 Rule 7 of CPC are all procedural in nature and section 28 of the Maharashtra Rent Control Act is a special provision under the Act which ought to be interpreted giving purposive interpretation to give it more effect and should not be preferred to any other interpretation which will lead to negating the provision. (viii) The Court has properly exercised the discretion and no case of interference is made out. Section 28 -Inspection of premises-The landlord shall be entitled to inspect the premises let or given on licence, at a reasonable time after giving prior notice to the tenant, licensee or occupier." 7. Section 28 of the Act of 1999 gives a right to the landlord to inspect the premises let or given on licence at a reasonable time after giving prior notice to the defendant, licensee or occupier. Section 28 in terms recognises the inherent right of the landlord to inspect the premises which he has let or given on licence at all reasonable times. The only qualification is a prior notice to the tenant, licensee or occupier by the landlord. The prima donna question would be the extent of this right of inspection. 8. No doubt, the literal interpretation is the golden rule of interpretation if the words used are capable of one construction as has been observed by the Apex Court in a case of Satheedevi (referred supra) and relied upon by the learned senior counsel for the petitioners. 9. However, the Rent Act of 1949 is a remedial statute and not a penal statute. A remedial statute has to receive a liberal construction, whereas the penal statute is strictly construed. The remedial statute or a word in such statute must be so construed as to give a most complete remedy which the phraseology will permit. 10. The words in the statute should ordinarily be understood in a sense in which they best harmonize with the object of the statute and which effectuate the object of the legislature. It cannot be interpreted in a manner, it would render the provision a dead letter. 11. The purpose of Rent Legislation is generally to protect the tenants from unjust evictions and in case of doubts these Acts are to be so interpreted as to lean in favour of tenants. Further, a law enacted essentially to benefit a class of persons, such as tenants, may be comprehensive in the sense that to some extent it benefits also those not within that class, for example, landlords. The provisions enacted to benefit the landlords cannot be so construed as to benefit the tenants as has been held by the Apex Court in a case of Arjun Khiamal Makhijani Vs Jamnadas C Tuliani, MANU/SC/0031/1989 : (1989) 4 SCC 612. The Apex Court in a case of Joginder Pal V Naval Kishore Bahal, MANU/SC/0453/2002 : AIR 2002 SC 2256 has observed that the Courts have to adopt a reasonable and balanced approach while interpreting Rent Control Legislations starting with an assumption that an equal treatment has been meted out to both the sections of the society. 12. The word 'inspect' the premises would have to be given the meaning which would subserve the purpose to enacting the same. Every landlord has a inherent right to inspect the premises being the owner of the house and it is the said right which has been recognized by section 28 of the Act of 1999. The said provision was introduced for the first time in the Rent Act of 1999. Similar provision was not provided in the earlier Rent Act of 1947. 13. To take an illustration, Section 14 of the Rent Act cast a duty on the landlord to keep the premises in good repairs. If the landlord neglects to make repairs, the tenant has a right to give notice to the landlord asking the landlord to carry out such repairs. For ascertaining the repairs required to be carried, the landlord will have to inspect the premises. The landlord would not be an expert to know the extent of repairs to be carried out. 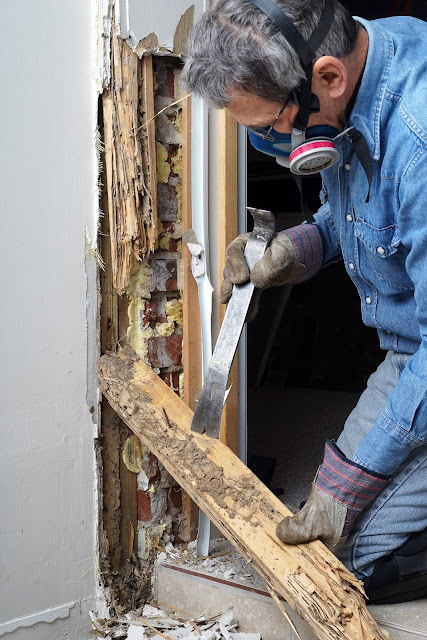 Naturally while making inspection for the purpose of ascertaining the repairs to be carried out, the landlord would be required to take with him expert, such as, Architect etc to know the exact extent of the repairs to be carried out. It is the obligation of the landlord to carry out the repairs. For performance of its obligation the landlord will be required to inspect the property. The right is given under section 28 to the landlord to carry out inspection. If the word 'inspection' by the landlord would be restricted to just observing the repairs without taking an expert with him, the right given to the landlord vide Section 28 would not serve any purpose. It would be rendered superfluous. Giving such an interpretation to the said provision would be rendering the said provision otiose. As such, the said term 'inspection' will have to be given wider interpretation so as to serve the object of enacting the said provision. The said provision will have to be so interpreted so as to achieve the aim of workability of the enactment as a whole while giving it a purposive interpretation in preference to the literal or textual interpretation. Section 28 has to be invoked in aid of other provisions of the Statute. Inspection of a premises to ascertain whether they are in good repair or in a good condition means a critical examination." Inspection means to look upon, to examine for the purpose of determining quantity and detecting what is wrong and is not necessarily confined to optical observation but is ordinarily understood to embrace test and examination. Examination is something more than a mere glance. Considering the said definition, restricting the word 'inspection' to a narrow construction would not be fructifying the purport and object of the said provision. The word 'inspection' will have to be read considering the purpose of inspection. 15. Reliance on Rule 2(b) of the Rules may not be relevant for determining the right of the landlord to make an application in the court. The applications referred thereto are the applications which a party can make de hors the pendency of the suit or independent of a suit as is provided in the respective provisions, whereas section 28 gives the right to the landlord to inspect the suit premises at all reasonable times. It is not restricted in its operation. Section 28 recognizes the inherent right of the landlord to inspect the premises which he has given on let. The said provision will have to be applied having regard to the purpose of inspection. 16. The plaintiff herein has filed a suit for possession on the ground that the landlord requires the suit premises bonafidely and reasonably for the purpose of immediate demolition which demolition is required to be carried out for constructing a new building as is contemplated under section 16(1)(i) of the Act of 1999. The landlord has to give an undertaking to the Court that the plans and estimates of the new building or new floor or floors to be erected by the landlord include premises for each tenant with the carpet area equivalent to the area of the premises in occupation of the tenant in the building sought to be demolished. According to the plaintiff, carpet area in occupation of defendant no. 4/petitioner no. 2 is 730 sq. ft whereas according to defendant no. 4/petitioner no. 2 the carpet area in her occupation is 1565 sq. ft. While providing the premises in a new building it is the duty of the landlord to provide for the same carpet area. For the said purpose, it would be necessary for the plaintiff to ascertain the exact area in occupation of the defendants and for the said purpose he has right to enter upon the premises and inspect the area in occupation of the defendants. In doing so, he would be entitled to take his own representative to measure the area. The landlord would not be an expert to measure the premises. The person who is expert to carry out measurement such as the surveyor would be required to be taken by the landlord to inspect the premises for performing his obligation of providing the same carpet area in occupation of the tenant in the new building. The landlord will have to satisfy himself of the exact area in occupation of the tenant so as to provide for the same. If Section 28 is interpreted in a manner that the landlord cannot take any other representative along with him, then it would render the said provision ineffective and redundant as the purpose of inspection would not be achieved. Even if to satisfy himself the plaintiff measures the tenanted premises through his surveyor, the said measurement carried out by the surveyor will not be akin to and on the same pedestal as that of the Court Commissioner. The tenant being in occupation of the premises, he can get his area measured through his expert. There is no prohibition for him. In the present case, the surveyor allowed to be taken by the plaintiff is not in the capacity of a Court Commissioner but the Court has only granted leave allowing the plaintiff to exercise his right under section 28 as the suit is pending before the Court. 18. The learned Single Judge of this Court in a case of Smt. Kamlabai Laxman Mutraj (supra) has also held that under section 28 of the Act the landlord can be accompanied by his Architect or other representative to take measurement of the tenanted premises. 19. In view of the aforesaid conspectus of the matter, the order of the trial Court does not require any interference. The Writ Petition, as such, is accordingly dismissed with no order as to costs. 20. At this stage, the learned Counsel for petitioners seeks continuation of the interim relief for a period of 8 weeks. The learned Counsel for the respondent opposes the said request. Considering the fact that the interim orders were in operation, the same is continued for a period of 6 weeks from today. Needless to state that on lapse of 6 weeks, the said interim orders will come to an end.